Yesterday, 26 March 2018, Hamburger Hafen und Logistik AG (HHLA), the leading European port and transport logistics group, signed a contract to acquire Estonia’s leading stevedoring company Transiidikeskuse AS. Transiidikeskuse AS (TK) operates TK Muuga, the largest Estonian container terminal located at the port of Muuga on the Baltic Sea close to the country’s capital Tallinn. The terminal has a capacity of 600,000 TEU, 4 quays with a total length of 1,094m and depth of 12.5-14.5m. The facility is well equipped with 3 STS cranes, 1 RMG (all by Konecranes), 6 Kalmar RTGs, 11 shuttle carriers and 9 reach-stackers. Apart from container operations, TK handles also general, bulk and refrigerated cargoes at its multipurpose terminal. However, due to the huge drop in container traffic in neighbouring Russia in 2014-2015, coupled with the country’s efforts to re-direct cargo flows to the national Baltic gateways of St. Petersburg, Ust-Luga and Bronka, the Muuga container terminal has been largely underutilized in recent years. Thus, the total container throughput of Estonian ports in 2017 was only 230,400 TEU, all mostly handled at TK Muuga. HHLA expects to bring more cargo to the terminal by integrating TK into the HHLA network, taking advantage of synergies and further professionalising sales and operations. HHLA sees a possibility to increase the terminal’s capacity up to 800,000 TEU. Aiming to grow internationally, HHLA enters a new regional market with this acquisition, a market with a clear growth potential due to its geographic position and links to the ‘New Silk Road’. 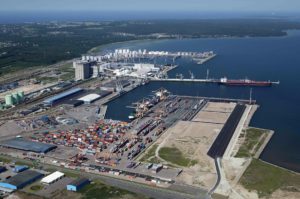 The Port of Muuga is not only the main port in Estonia, it is developing into a multimodal hub as a result of regional infrastructural projects, such as the Rail Baltica project. TK Muuga already has a rail connection handling container trains to Moscow and to the Central Asian countries. The deal is expected to be closed in the second quarter of 2018, subject to various conditions precedent. HHLA’s Supervisory Board has already approved the acquisition. The new subsidiary will be allocated contractually and organisationally to HHLA International GmbH. Since 2005, HHLA is also operating a container terminal outside of Hamburg in the Ukrainian city of Odessa.